It’s been a while since I’ve posted an updated pic of this year’s bookshelf (for the Empty Shelf Challenge). 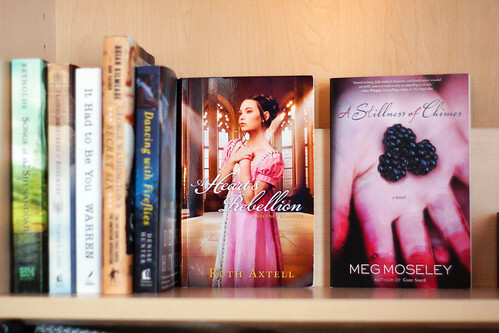 Here’s an updated “bookshelfie” after a couple months and a few INSPY reads have stacked up! 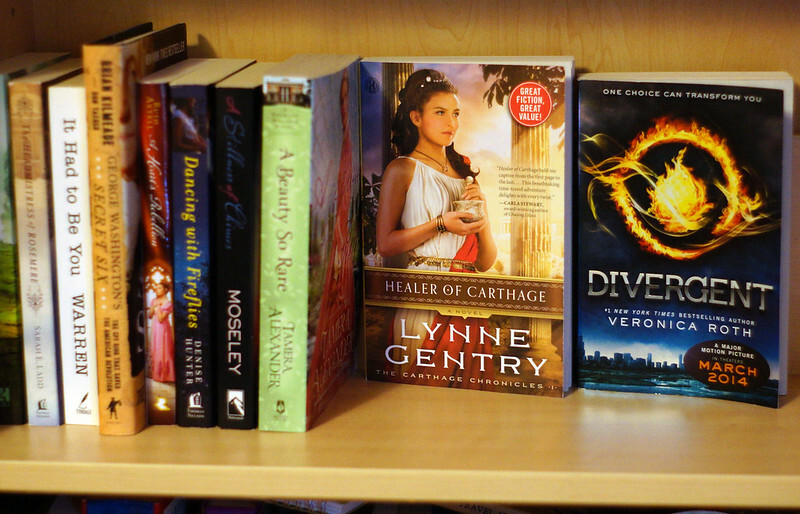 My latest reads this week are Healer of Carthage by Lynne Gentry and Divergent by Veronica Roth. (They are books 13 and 14 in my Empty Shelf Challenge!) Two TOTALLY different books. I loved them both for different reasons. Later next week, I’m excited to post a review of Healer of Carthage AND an interview with author Lynne Gentry. She’s just fabulous! Here are my thoughts on Divergent, also posted on Goodreads. Never a dull moment. That sentence best sums up my thoughts on “Divergent”. It is a skillfully written, fast-paced adventure, exploring themes of bravery, selflessness, sacrifice, and the strength of love. 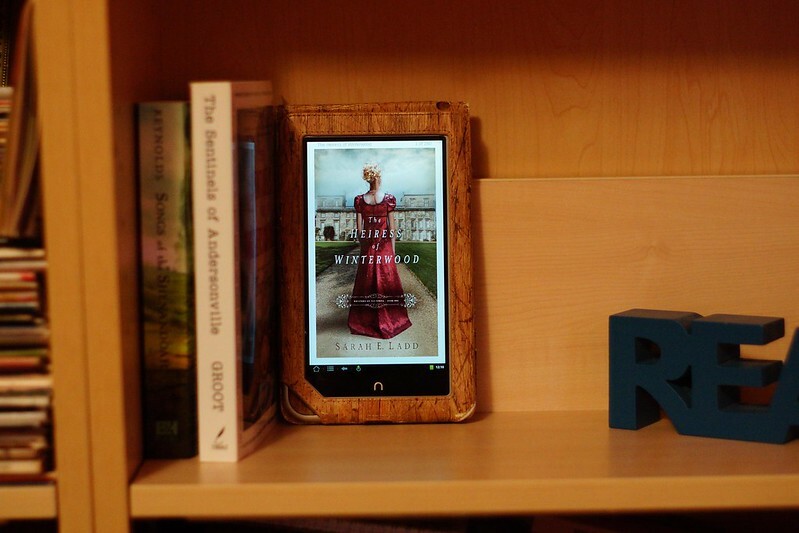 From the beginning, the reader is plunged into the story of Beatrice and her world. Veronica used a proper combination of action and feeling to convey each scene. I loved getting to know the characters through the course of the book. The only reason I did not give it 5 stars was my dislike of some of the content. Mild profanity, depictions of drinking, and some of the suggestive content cause me to hesitate. I would give it a “PG-13” rating. The violence I expected, but some of the other content I did not, considering its popularity among young teens. Despite the reasons above, I still thoroughly enjoyed “Divergent” and would recommend it to YA, Dystopian, and Sci-Fi fans alike. Because I typically read Christian or Inspirational fiction, I would caution someone reading “Divergent” to keep in mind that it IS secular fiction. I definitely plan to finish this series – I can’t wait to see what predicaments Tris gets into next! Have you read either of these books? What are your thoughts, from a Christian perspective, on Divergent? Have you seen the movie? My most recent read was A Stillness of Chimes by Meg Moseley. It’s an alluring contemporary drama with elements of mystery and romance. One my favorite things about it was its subtle “Southern charm”. Growing up in a small Ozarks town myself, I appreciate the familiarity, closeness, and quirkiness of the characters that grew up in the Appalachians. Laura Gantt has returned to her hometown of Prospect, Georgia, in the heart of the Appalachians, to sort through her recently deceased mother’s belongings. Her father, Elliot Gantt, was believed to have drowned when Laura was still a teenager. Now facing her future with no parents, she feels starkly alone. Mysteriously, rumors of sightings of her father Elliot begin to circulate. Now revisiting childhood memories of both happiness and possible desertion, Laura must sort through her doubts while cultivating this new possibility of hope. 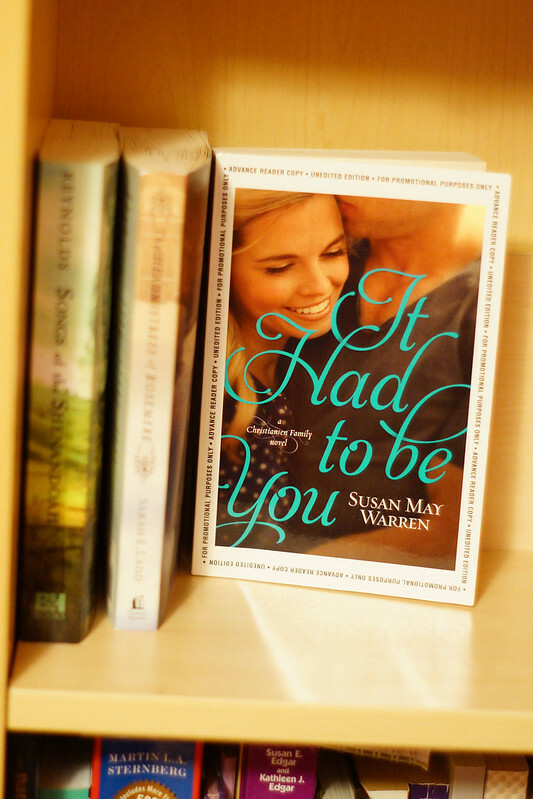 Sean Halloran, Laura’s best friend from childhood and her high-school sweetheart, reenters her life with perfect timing. Growing up in an abusive home, Sean looked up to Elliot Gantt as a father figure and mentor. With haunting memories of his own surrounding the disappearance and supposed drowning of Elliot Gantt, he has his own reasons for reconnecting with and protecting Laura. They work together to dispel rumors and discover long-buried secrets of the Gantt family. The new information they learn shatters their expectations and threatens to change all they believed to be true. In the midst of it all, Sean and Laura confront their feelings for one another and the reasons their romantic relationship ended years ago. Meg skillfully maintains a thread of suspense and mystery throughout the story as the characters cope with secrets and uncover new dangers. Meg’s prose paints a beautiful backdrop for this story. 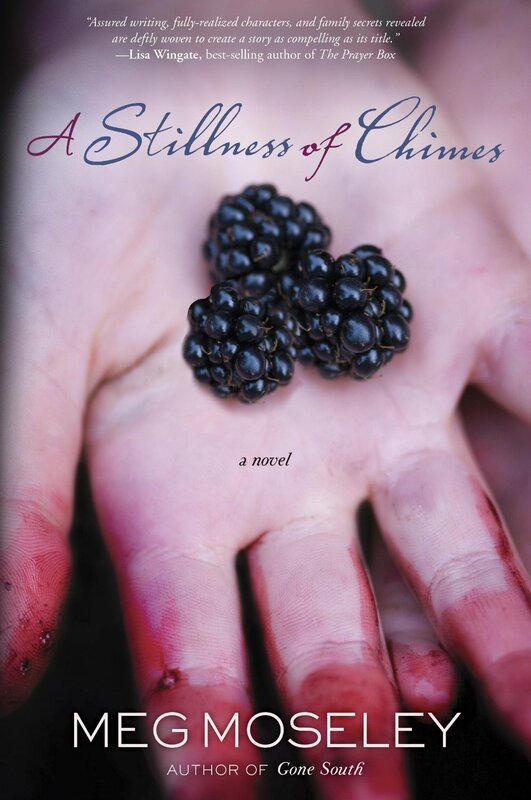 A picturesque town, mountain living, bluegrass, blackberries, friendship, kudzu, and little old ladies all make A Stillness of Chimes a unique and charming story of love and sacrifice. Meg deals with some tough issues within this story, including abuse, abandonment, and even the PTSD-like problems of a Vietnam veteran. She confronts these problems realistically and carefully, showing their effects and influence on the characters. The characters face questions of faith and sacrifice during the course of the story. Love and honor motivate the characters as they learn valuable lessons in forgiveness and the importance of love. Overall, I really enjoyed this novel and would recommend it to anyone looking to read a family drama with unexpected twists and a little romance – just make sure you have plenty of time to read, because you might want to read it straight through! Note: Thank you to the publisher for a complimentary copy in exchange for a review! I received this book for free from WaterBrook Multnomah Publishing Group for this review. I was not required to write a positive review. You can connect with Meg Moseley at her website. on her Facebook page, or on Twitter. Oh, and here’s my latest two books for the Empty Shelf Challenge! A Heart’s Rebellion was book 10 and A Stillness of Chimes was book number 11. What is your favorite thing about your hometown? Your comments are always welcome! And…another one’s on the shelf! 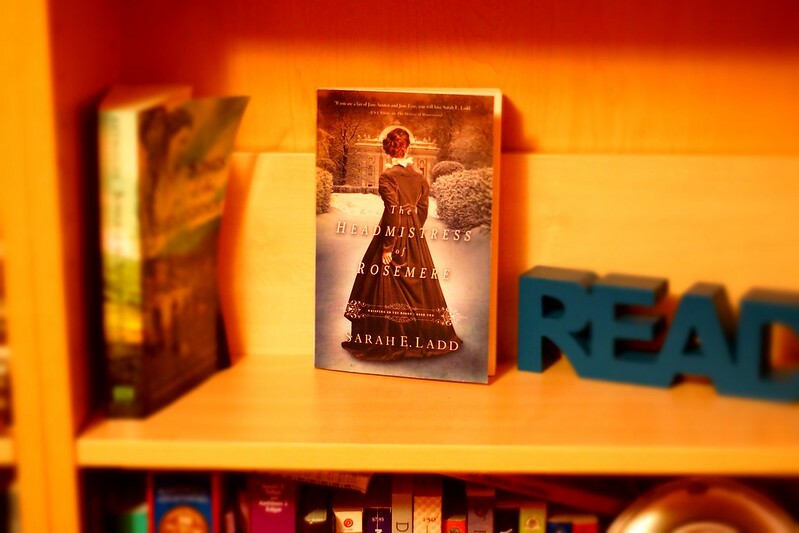 I loved this Regency-era novel by Sara E. Ladd. Check back in the next few days for a full review! My third read for 2014 was The Heiress of Winterwood (the first book in her Whispers on the Moors series) by Sarah Ladd. Set in the lovely Regency Era in England, Amelia Barret and Captain Graham Sterling (don’t you just love that name!) find their paths intertwining over their mutual love of baby Lucy Sterling. Captain Sterling’s deceased wife, Katherine, relied on Amelia’s care as her dying wish evoked a promise from Amelia to always care for her daughter Lucy. As Amelia strives to find her way as the future heiress of the Winterwood Estate and to keep her promise to Katherine, her pending marriage to Mr. Littleton hangs in the balance as she encounters Captain Sterling on his return from the sea. The story is a delightful tale with bits of mystery, conflict, and romance as the characters find themselves depending on God’s strength for their futures. I really enjoyed the way Sarah portrayed the strictures and propriety of the Regency Era – with a bit of glamour and nostalgia. Find out more about Sarah and her newest release, The Headmistress of Rosemere (my next read) at her website. Thank you to Amber at Seasons of Humility and Juju at Tales of Whimsy for the mini review idea! I finished my second read for the Empty Shelf Challenge over the weekend. 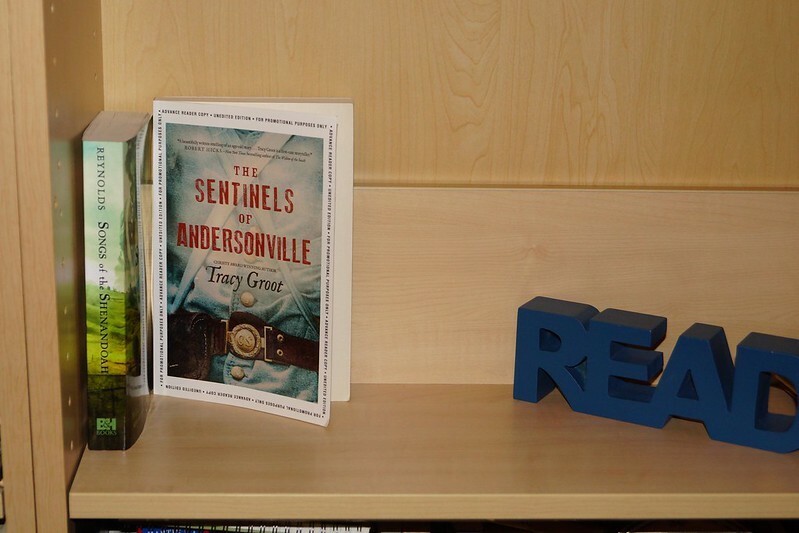 It was an advance copy of “The Sentinels of Andersonville” by Tracy Groot. A captivating, fast-paced retelling of the parable of the Good Samaritan, “The Sentinels of Andersonville” is in a league all its own set during the Civil War period. Saying “I loved it” is putting it mildly – I think it’s going to be one of my favorites of 2014! It releases 2/1/14 ~ review to come soon!